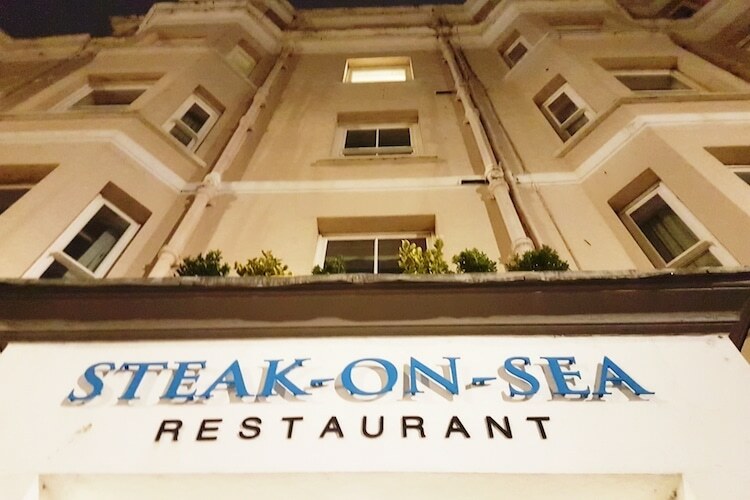 Located in the historic Old Ship Hotel on Brighton seafront is Steak-on-Sea. Don’t be fooled by the name though, there is so much more to this restaurant than ‘just’ excellent steak! The Old Ship has a cavernous dining room with a ceiling that disappears into the ether. 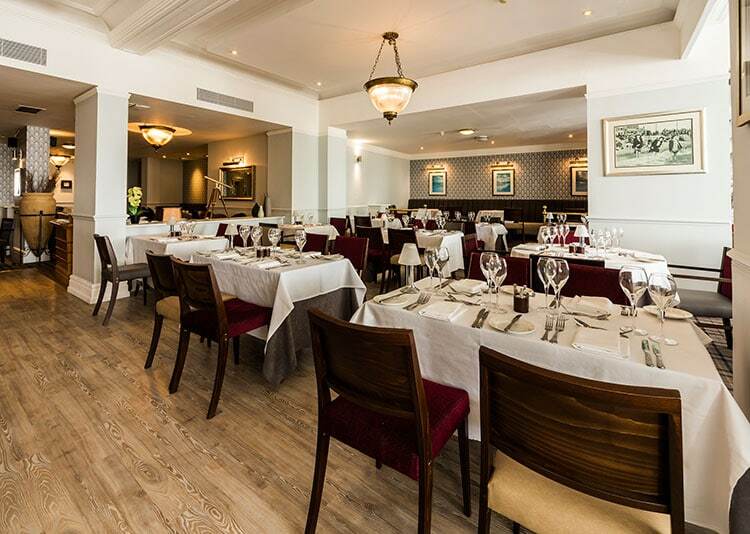 Separated from the main breakfast area by billowing white curtains, the frontmost section, offering views of the sea through large sash windows, is where Steak-on-Sea resides. It’s not the trendiest of locations, there are no bare brick walls or cactuses on the tables here. 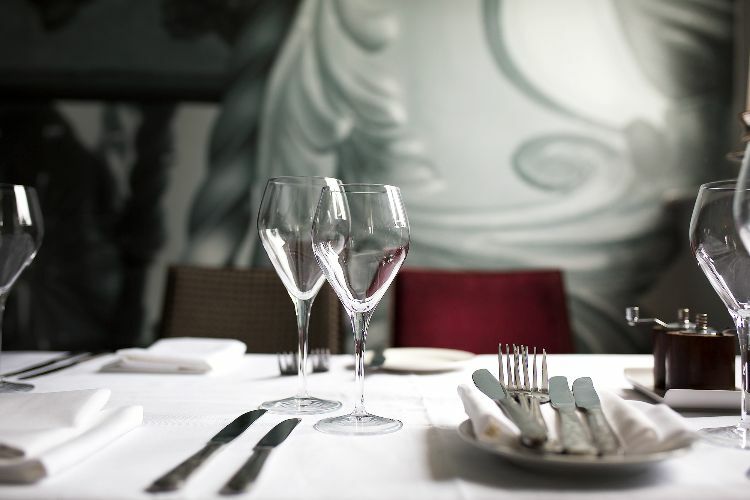 However, you do have pristine white linen, glittering silver candelabras and cutlery, immaculate glassware, stylish crockery, comfortable seating and the sort of slick, respectful service you would expect from a good hotel. Once you are nestled at your own beautifully set table, relaxing in your individual pool of romantic candle light, the rest of the room melts away and it’s just you, your companion(s) and the exceptional food. We were there to try out the new menu and we were in for a real treat. We decided to share a bottle of Antonio Rubini Pinot Grigio, which was light, fruity and fantastically dry. We were promptly brought freshly baked, crusty rolls and a cute little dish of butter, covered with its own miniature silver cloche. 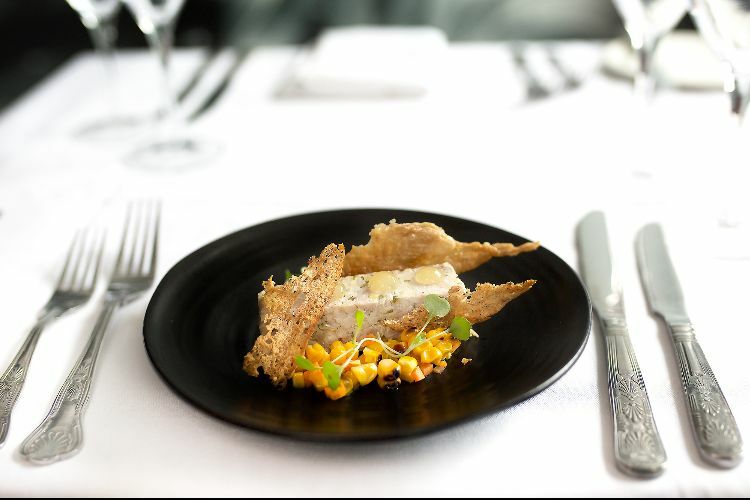 Andrew chose to start with the crayfish and Devon crab cake, which came with buttered samphire, spiced cucumber salsa, brown crab mayonnaise and parsley and I opted for the chicken and leek terrine with crispy skin, sweetcorn pickle, pickle gel and crisp bread. Both plates were beautifully dressed, with exquisite attention to detail. 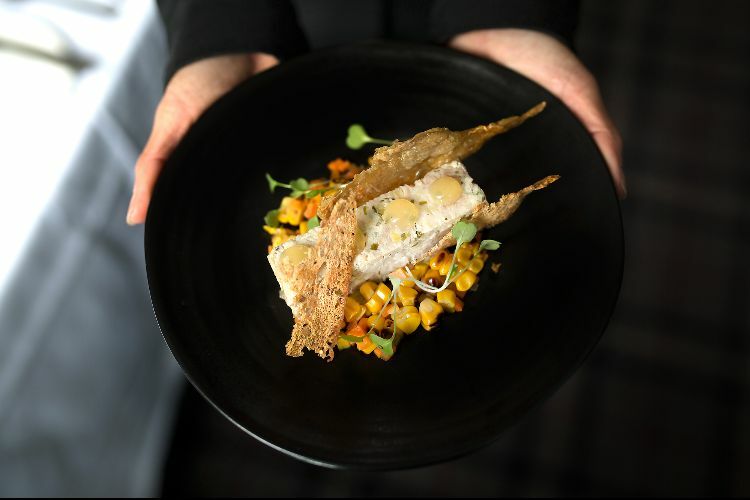 Vegetables were finely diced to exactly the same size, dots of mayonnaise were equally spaced and everything on the plate had been placed with care and precision to create a very appealing visual whole. 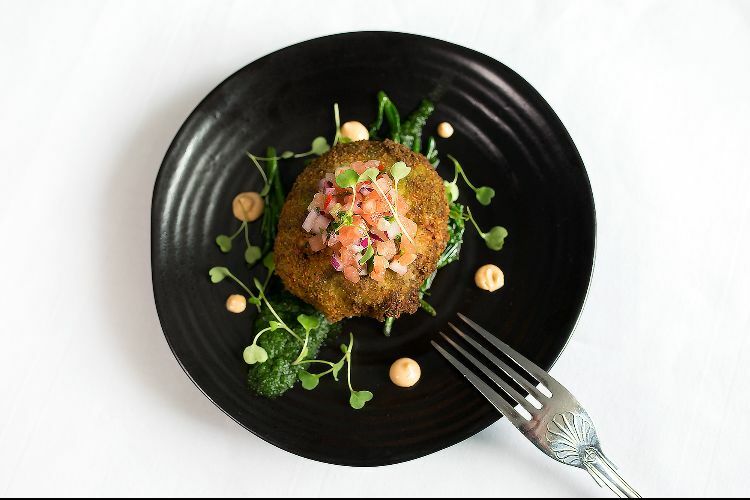 The crab cake was soft and fluffy with a crunchy coating and delicate flavour, beautifully complimented by the fresh, zingy salsa and smooth rich mayonnaise. The chicken terrine was light, herby and a welcome reminder of summer. The crispy bread and skin brought added texture and saltiness to the plate and I savoured every mouthful. 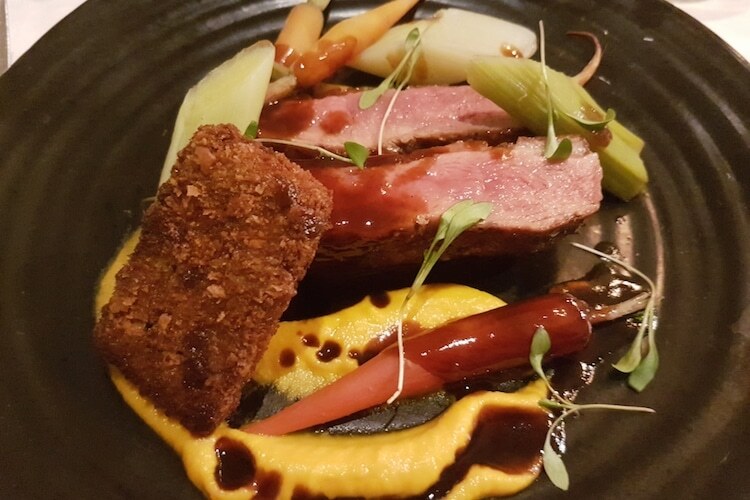 For his main Andrew had the English duck breast, cooked pink with a crispy leg nugget, carrots, leek and honey malt jus. If the starters were pretty, this dish was a work of art, with stunning colours popping against the jet black plate. The duck was expertly cooked with crispy skin and rendered fat, and well-rested so the meat was tender and juicy. Add to that the delightful croquette, sweet carrots and intense glossy jus and the dish was a triumph! 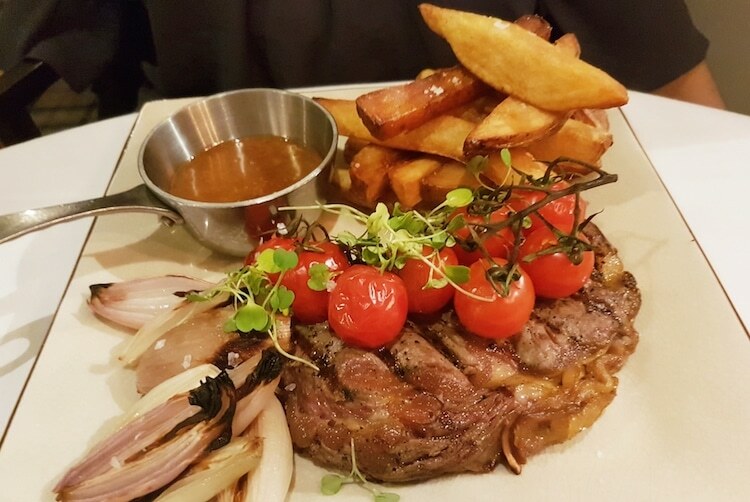 I had the chargrilled rib-eye steak, which came with triple cooked chips, roasted shallots and vine tomatoes. The steak came exactly as ordered, on the rare side of medium, and was melt in the mouth succulent. The chips had a great crunch and just the right amount of salt. The sweet caramelised shallots were gorgeous and the juicy tomatoes added some moisture and acidity. I also had peppercorn sauce, which was rich and good and fiery. 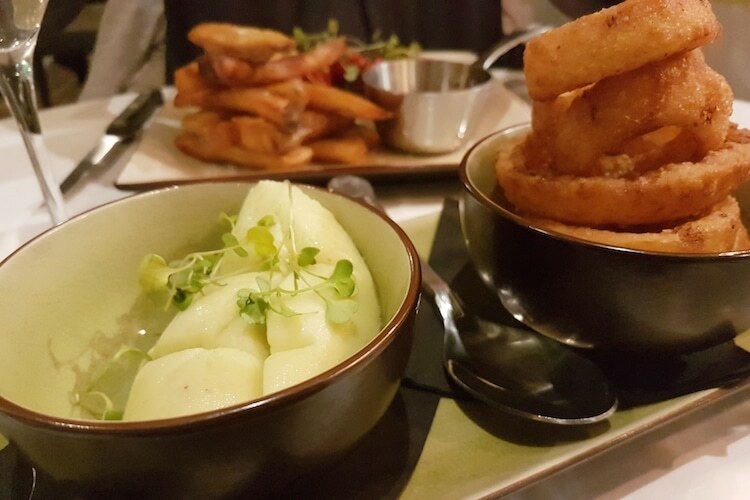 At the recommendation of restaurant supervisor Phillip, Andrew also ordered a side of buttery, parsley mash, a perfect accompaniment to his duck dish, smooth and soft, and subtly herby and I ordered some fabulous crisp, chunky, onion rings. For dessert I had the chocolate marquise, with praline mousse and blackcurrant sorbet. 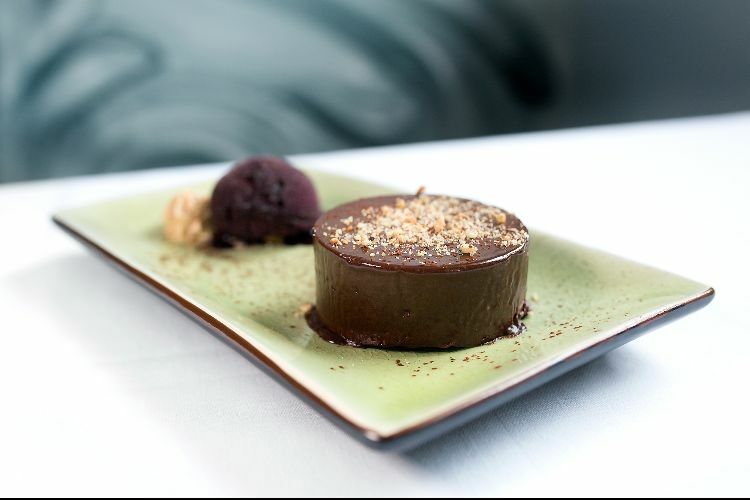 Rich, dense, dark, sweet, intense chocolate with a sharp, refreshing sorbet and a praline mousse that, if I’m honest, I could have eaten all on its own, yum! 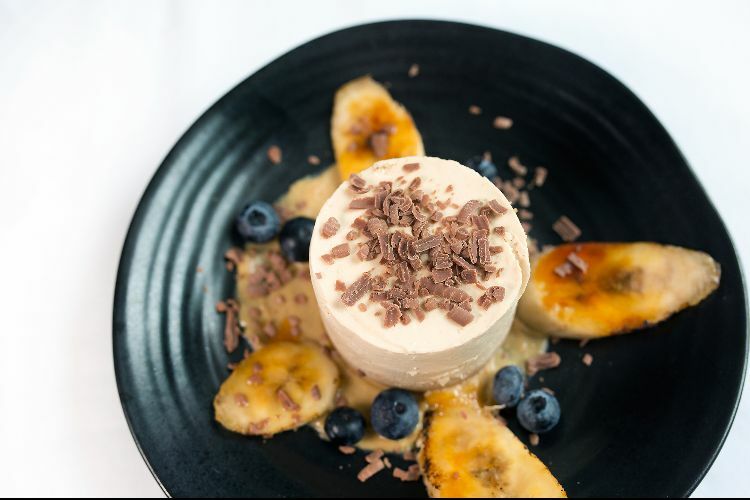 Andrew had the banoffee cheesecake, with toasted banana, barbequed banana sauce and blueberries. From what I was allowed to taste, it seemed to me to have all the goodness of a banoffee pie but the cheese cleverly balanced out the sickly sweetness. 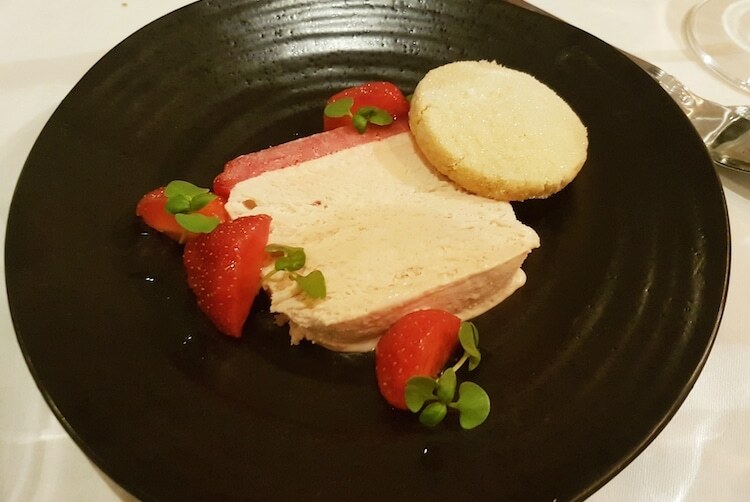 Phillip suggested we pick a third dessert to try (who were we to argue) so we also ordered a strawberry parfait, with sweet basil gel, strawberries macerated in late harvest sauvignon and a shortbread biscuit. I’m glad we did because it was definitely my favourite. 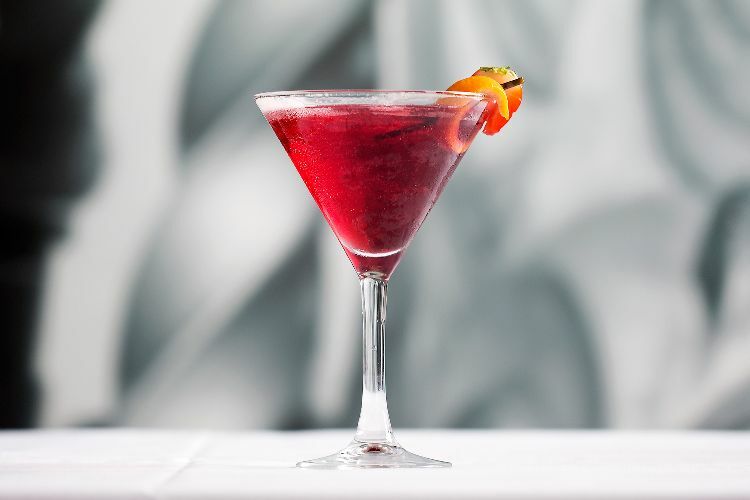 An intense strawberry flavour and supernaturally smooth, velvety texture. Sublime! strawberry parfait, sweet basil gel, strawberries macerated in late harvest sauvignon and a shortbread biscuit. 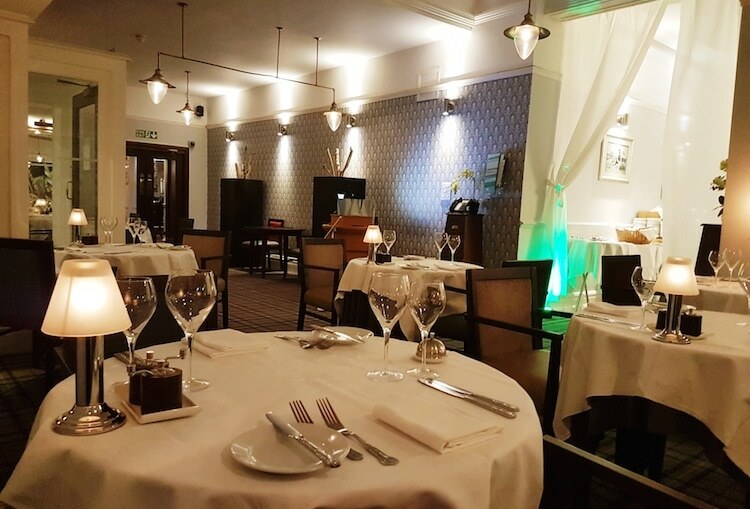 In summary, Steak-on-Sea is a stand out restaurant in its own right and should most definitely be enjoyed by everyone, not just those lucky enough to be staying at the hotel. 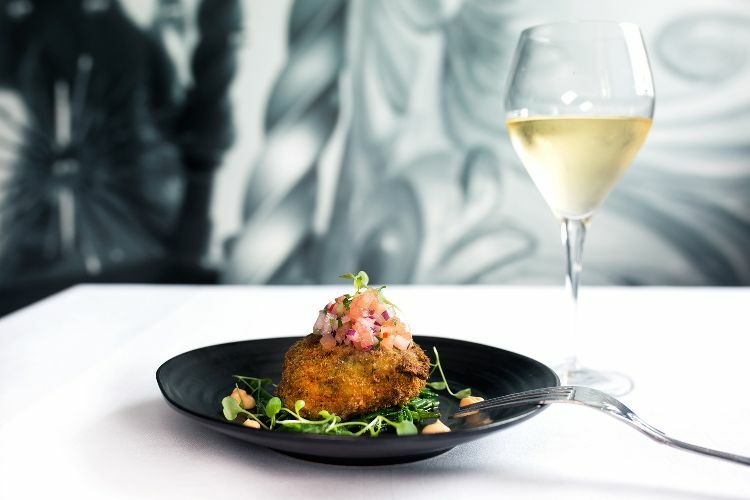 So, whether you want to treat a special someone or just fancy a luxurious meal, by the sea, with excellent service, in the oldest hotel in Brighton, then pick up the phone and book yourself a table, you won’t be disappointed.